308 pages | 8 B/W Illus. The underlying frame of social work is the nation state, and it is from within the state that welfare strategies and social policies are devised and implemented. However, post-colonialism, globalisation, migration and the associated implications for human rights, social justice and social welfare policies contest the idea of a clearly defined space for social work and present new challenges for researchers and practitioners. 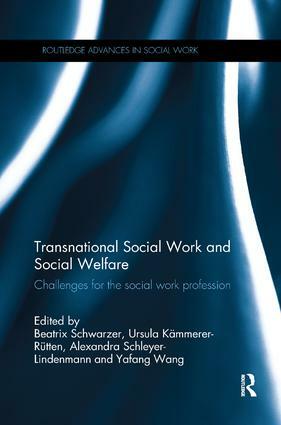 Transnational Social Work and Social Welfare argues for the increased importance of the transnational perspective in social work theory and practice. The book challenges the idea of the nation state as a given entity and argues that globalization and an increasing number of people crossing borders must have an impact on the theories and strategies of social work. The international contributors are critical of a restricted focus on a geographically defined space and the impact on work with clients. With cases covering China, France, India, UK, Germany, Malaysia, Israel, Turkey, the book highlights the challenges as well as the opportunities this new perspective can open up for theories and strategies in social work. It will be of interest to students, researchers and social workers interested in migration, social care, poverty and cultural competency in health and social care. The carefully edited volume impresses with the diversity of the authors, the attachment as a discourse with perspectives beyond Western Europe. Even if case studies and commentaries were not always strictly related to each other, vivid or comparative: it is a substantial, noteworthy, even transnational stimulus. Part 4: Last thoughts - and yet another perspective! Beatrix Schwarzer is Senior Lecturer at the Department of Health and Social Work at Frankfurt University of Applied Sciences, Germany. Ursula Kämmerer-Rütten is Senior Lecturer at the Department of Health and Social Work at Frankfurt University of Applied Sciences, Germany. Alexandra Schleyer-Lindenmann is Associate Professor of Psychology at the Science Faculty of Aix-Marseille University, France. Yafang Wang is Assistant Professor at the Department of Social Work, Shanghai University, China.